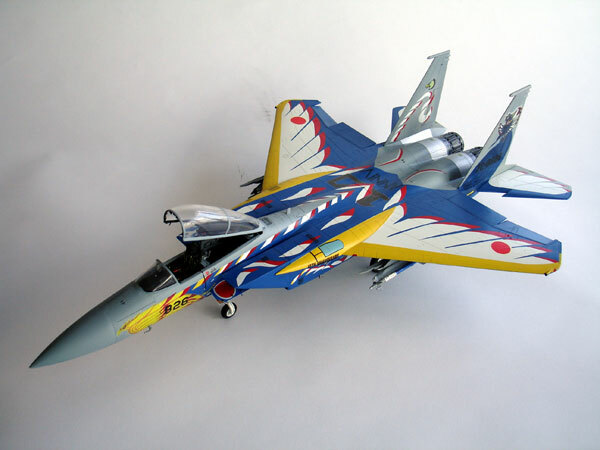 [ KIT A ] Japanese ASDF F-15J. 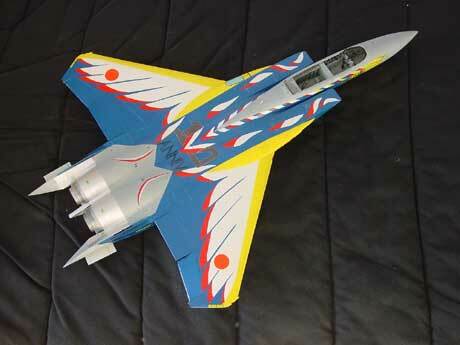 The Japanese F-15J version of the Eagle was also seen in a spectacular Eagle bird display finish. The squadron is JASDF 204th on its 10th aniversary. This was a very attractive scheme to finish this model. I opted to select this one, a real challenge with all the complex patterns and colour that will require a lot of masking. 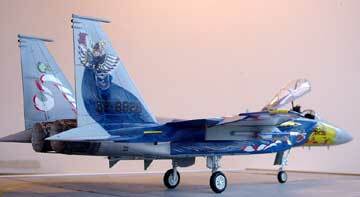 For the kit I used the good old 1/32 Revell F-15C. 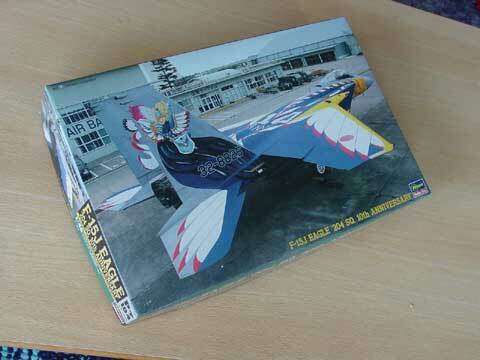 For reference, I used a boroughed Hasegawa F-15 1/48 kit, the box seen below. Some sections of the 1/48 decals are scanned, enlarged to 1/32 scale and printed on special Bare Metall Foil for Inktjet printers. Two sheets were needed: white and transparant. Only some markings were printed, all remainder of the paint scheme to be hand sprayed on with masking etc. Quite a job! Some parts of the demo schema are painted, others are applied through self made decals. 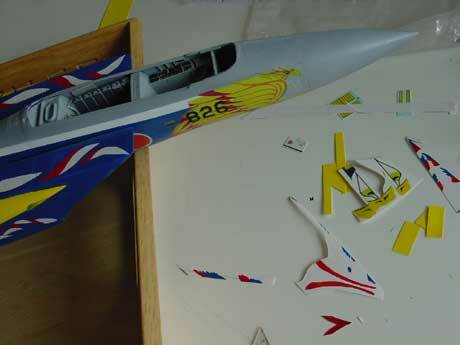 The self made decals were scanned from an 1/48 kit and some parts were grouped. The option to print all the scheme was not practical for a 1/32 kit and would need a lot op decals sheets and would become very expensive. I decided to only print the special themes like the bird head and tail heads, other sections were painted/sprayed with a lot of masking work. - stencilling to be printed also on transparant sheet. 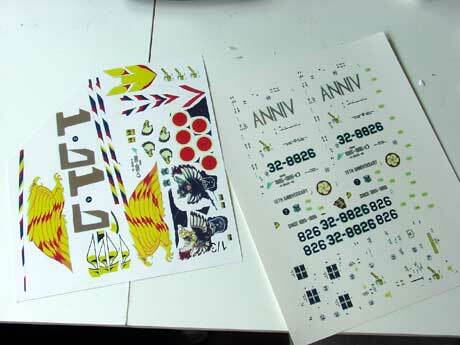 From Bare Metal Foil decals , 3 sheets were needed of the special InktJet decals, 1 white sheet and 2 transparant sheets. Even when using some decals, you need additional painting as colour is not always very "thick" and do not cover satisfactorily. the result of masking and painting of the complex paint scheme can be seen here. It is quite a job and takes a lot of time, masking, painting and again masking etc. But the results are worth it. 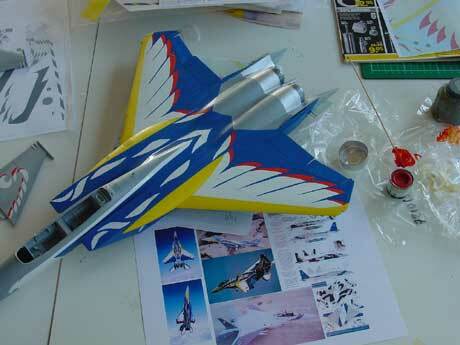 The vertical tail fins were treated separately to ease handling and masking. 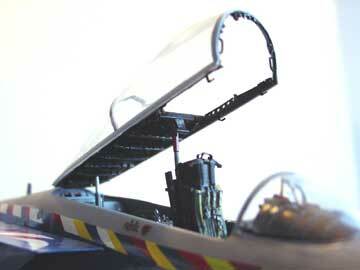 The detailed F-15J canopy frames with added mirrors and handles etc. 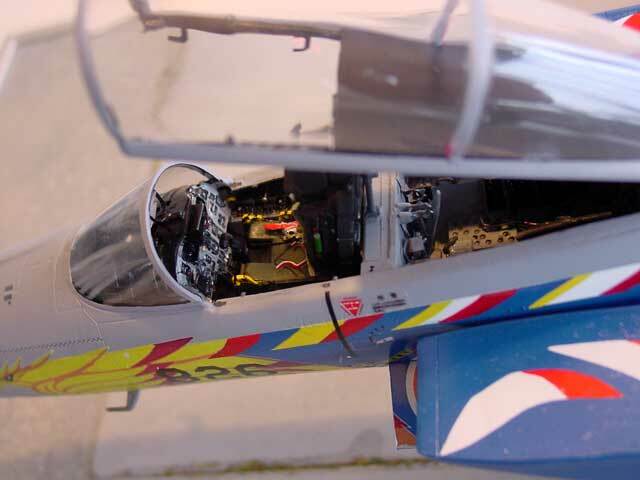 ... the detailed seat of the F-15J. 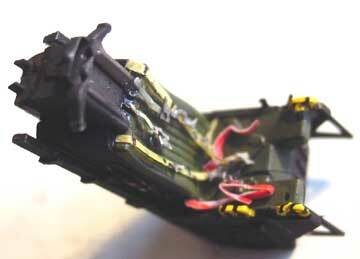 The Revell seat was used as a basis but modified and detailed with bits and harnass straps made from tape. 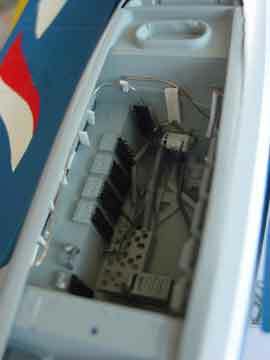 ... the detailed rear avionics bay behind the seat in progress of being made. All boxes and electrical lines were made from card and stretched sprue which took quite some work. 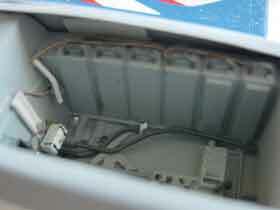 Note the widened edges of the cockpit side walls made from thin card strip. a view of the canopy, note the details inside and canopy "locks" made from cut out photo negatives. 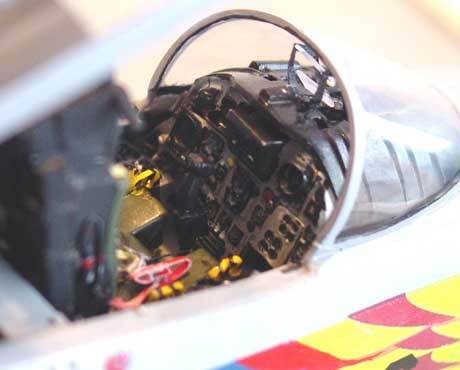 ....and instruments and cockpit of the Japanese F-15J. 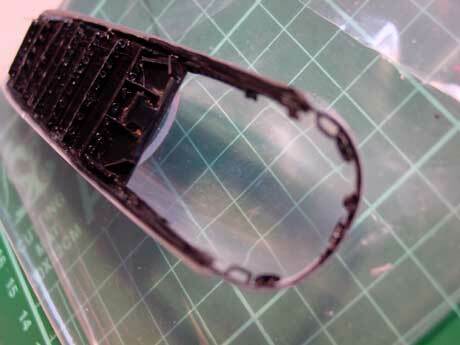 Also note the HUD that was made from cut out foil, detailed and painted to get the complex frame. 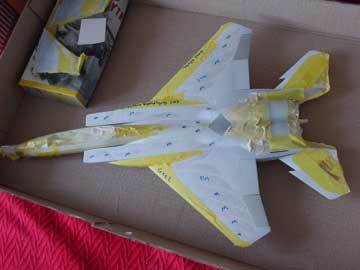 The cockpit edges and locks were detailed with scrap pieces of card and foil. 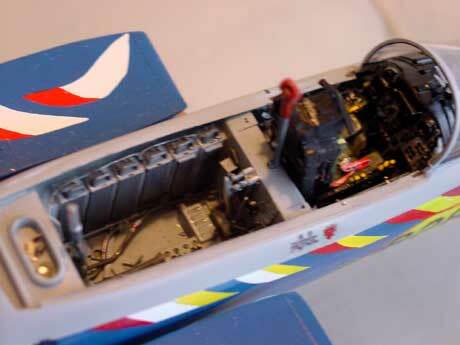 also, the lower avionics bay on the left forward cockpit fuselage side was opened and detailed with some boxes etc. 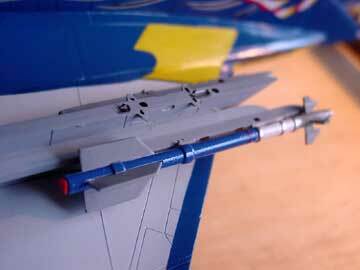 Air to air missiles are always a lot of work on any kit and especially on 1/32 scale. 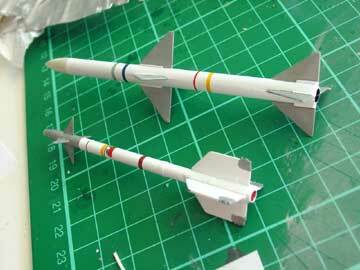 The Sparrow missiles came from the Revell kit but were detailed with some card strips. 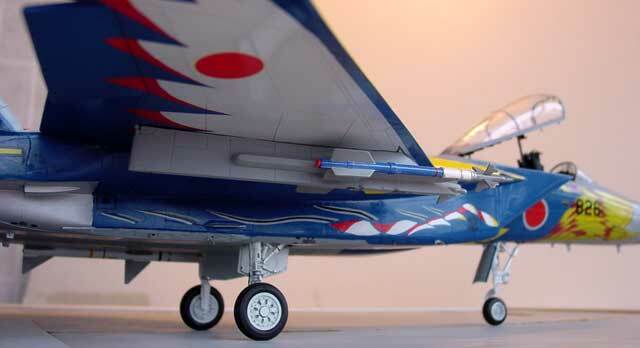 The Sidewinders were modified to represent special Japanese type AAM-3 missiles deployed on many modern JASDF fighters, including the F-15J. 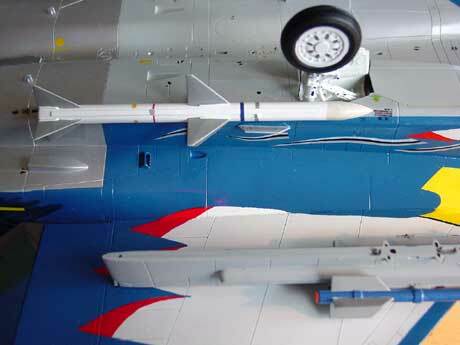 The AAM-3 missiles that can be found in the Hasegawa 1/48 F-15J kit were used as example on how to do it... Striping is from decals. The parts in this F-15J kit are a bit different to the parts in the Tamiya F-15C kit. 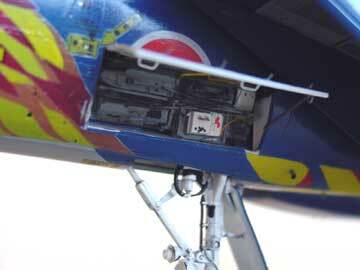 The ECM pod from the top of the tail was replaced with a mass balance. 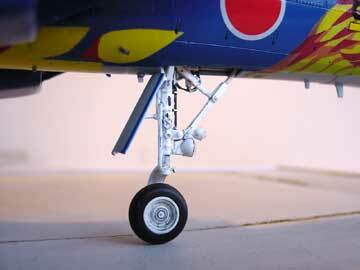 Some other type antenna's are added under the nose and under the intakes. 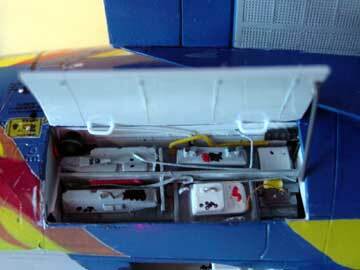 Some aircraft got upgraded with ECM stuff, so check photos. The main fuselage parts are similar to the Tamiya F-15E. 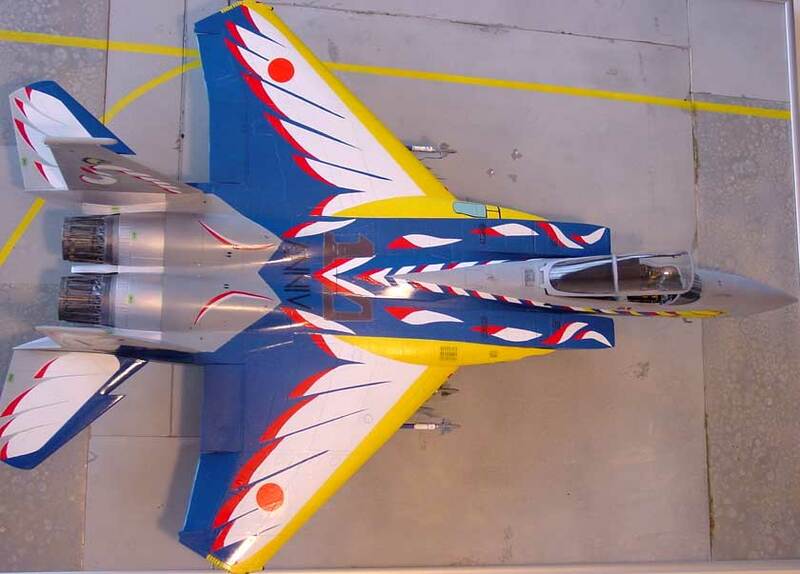 So some access panels and panellines should be a bit different for the F-15J. 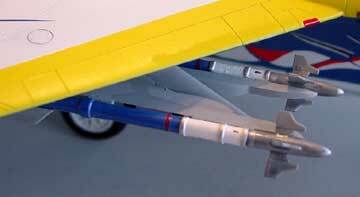 On the rudder, different type of small "bulges" can be found on F-15's , so check pictures. 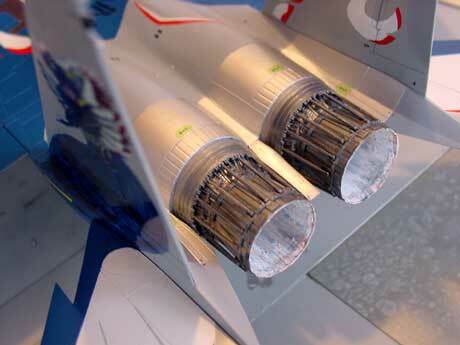 The horizontal stabilizers are of a F-15E but sometimes are fitted to F-15C aircraft so maybe also on F-15J.